A crown is a very strong precision fit cover that is placed over a tooth to strengthen a worn, damaged or broken tooth and to protect it in the bite. They are commonly used for teeth which have been structurally weakened by a large cavity or root canal therapy. Crowns are also commonly used for cosmetic reasons including enhancing the size, colour, shape and position of teeth. Placing a crown can be a way to preserve the tooth, so that it is might be retained for life. The end result is that it looks exactly like a tooth, and is matched to your other teeth. It is made in the laboratory by a specialist ceramist, who spends weeks making sure that it is perfectly matched, so that it cannot be detected in the smile. Brittle root treated molar and top premolar teeth are crowned to prevent the teeth splitting with the forces of biting, and to give them the best chance of being kept for a long time to come. A crown can be placed over a tooth that is still alive (vital) or one that has been root treated (non-vital). Research indicates that for every tooth that is judged to be alive (vital) and crowned, 10% go on to require root canal therapy. This is because the tooth is compromised to begin with, often with a deep filling or crack through it already, which may have compromised the pulp of the tooth.The dentist will take an x-ray in order to determine if the root of the tooth is healthy, and examine the tooth closely once all the old filling is removed. On occasions, a tooth that is cracked or very heavily filled, may require root canal therapy prior to crowning to ensure that an abscess does not develop, however this depends on the exact presentation of the tooth. All ceramic crowns are a type of crown made of pressed ceramic which is preferred for its longer lasting and superior aesthetic qualities, appears as real as is possible, and allows for extra strength and durability. 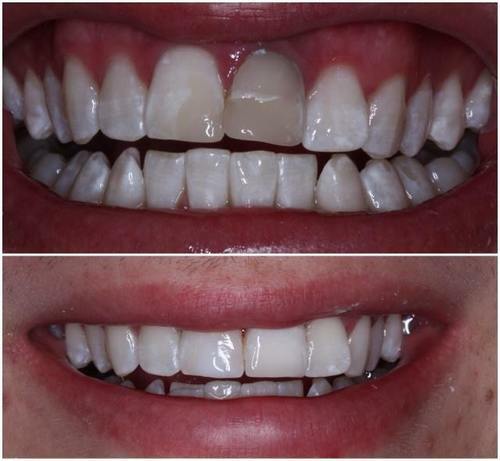 The all porcelain crown is computer designed and considered to be as good a match as is possible to replicate or improve on the way teeth appear, with pressed ceramic technology. The transparent colour and lifelike shape ensures that it is very unlikely to be noticed amongst your own natural teeth. These porcelain crowns are metal free which means there is no grey line at the gum line. They are strong, long lasting and extremely unlikely to crack or fracture. The preparation of the tooth takes 1 hour with the dentist, where impressions are taken and sent to the technician. A temporary crown is placed over the tooth and two weeks later the crown is ready for fitting in a 45 minute appointment. Crowns have a 5 year manufacturer's warranty from the laboratory against fracture, however this is contingent on attending six monthly preventive care appointments, to ensure that the gum and bone support around the teeth is optimal, and early changes are detected and attended to. Failure to floss or brush correctly around a crowned tooth, or attend to six monthly preventive dental care can be detrimental to the longevity of a crown. With good home care and monitoring with your dental professional, we hope to retain a crown for 10 to 20 years, depending on the underlying condition of the tooth. Our crowns are made with a specialist ceramist in Brisbane, who uses the latest CAD CAM technology for precision. Our dentists are experienced in shade selection and preparation designs to produce excellent aesthetics and function even for the most challenging situations.